These days it’s become more difficult to shop for individuals, especially with how “diverse” everyone’s tastes seems to be getting. It shouldn’t be at all, especially if you’re searching for something your good buddy or family member may enjoy. What Are The Best Educational Learning Tools For Children, Students and Entrepreneurs? Learning should never be taken for granted, especially when it comes to children, young adults and fans of acquiring knowledge. The best way to get people to be proactive in their studies is to make learning fun. 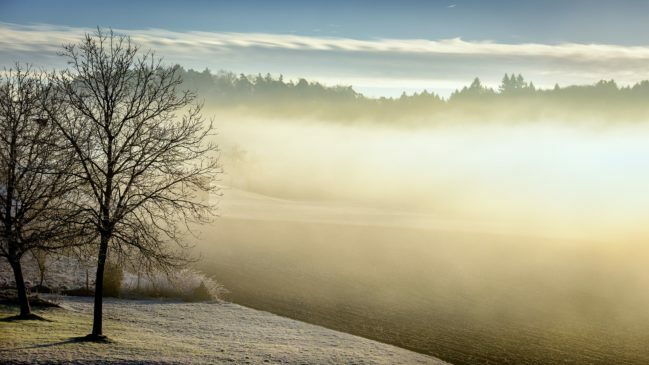 Instead of looking at it as work, consider taking a light-hearted approach to learning with these fun educational learning tools. One of the best workstations for accelerated learning and productivity. 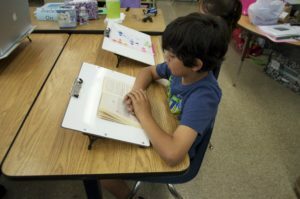 The Visual Edge Slant Board is a portable magnetic whiteboard clipboard that can be used for writing, reading, art and speech. The slant boards are ergonomic and fit right into my backpack with their adjustable legs. I personally have all four colors of these slant boards and find them to be extremely useful for getting things done. You can check out my video review below. Forget the old classic dollhouse. Light up your room with this state of the art dollhouse that lets you customize not just the furniture, but also a working doorbell, spinning fan, elevator, or whatever your imagination can dream up! 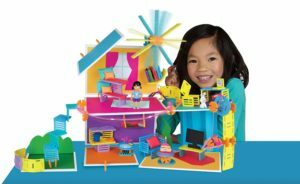 A STEM (Science, Technology, Engineering, Math) building toy for girls, Roominate is innovating how girls learn and play – This awesome product was on Shark Tank! Virtual Reality is next frontier in digital entertainment platforms. 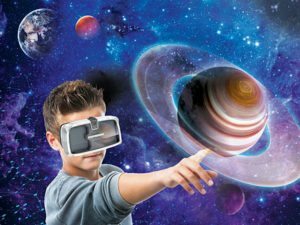 The Virtual Explorer Space Expedition 4-in-1 experience combines exciting virtual reality and augmented reality technology with hands-on planetarium activities and real STEM learning as you travel through our solar system! Imagine literally being in space while immersively learning about each constellation and planet. A whole new level of educational interactivity. If you’ve ever wanted to jam out on a guitar in front of your friends but don’t know how to play well, then consider checking out Chord Buddy. For aspiring guitarists, young and old, Chord Buddy makes it possible to pick up a guitar and learn how to play in no time. Whether you need to learn how to play the bass guitar, or an electric guitar chord buddy makes learning an instrument fun, simple and unique. Plus, don’t most songs utilize the same chords anyways? This product was also featured on Shark Tank! 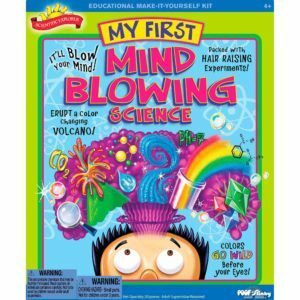 Encourage your young mad scientist with this cool “Mind Blowing” Science Kit. Learn the basics of chemical reactions and the use of science tools. This Scientific Explorer My First Mind Blowing Science Kit includes red cabbage powder, citric acid, baking soda, 3 color tablets, crosslinked polyacrylate copolymer, vegetable oil, corn starch amongst other chemicals. Get a head start on experimentation! Have you ever wanted to grow your own garden or set up your own aquamarine tank? Well, why not do both with the Back to the Roots Water Garden Fish Tank! 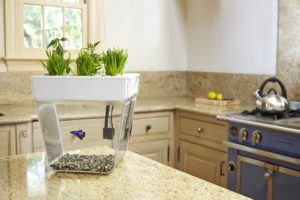 This mini aquaponic tank is a closed-loop ecosystem — the betta fish waste fertilizes the plants on top, and the plants filter and clean the water for your fish — not your average betta fish bowl! Create interactive inventions with this awesome electronics and gadget kit. 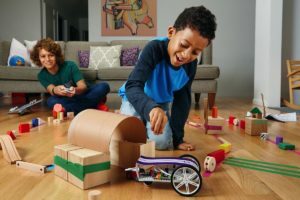 The littleBits Gizmos & Gadgets Kit comes with 15 electronic building blocks, detailed instructions for 12 projects, and all the accessories and tools you need to unleash the inventor within. Empower invention and innovation for tomorrow’s tinkerers and idea makers.